This Hardin Barbed point is very skillfully made. It's a good representative example of the Early Archaic people's flintknapping skill. This Hardin Barbed point was found several years ago in north central Illinois in Peoria County. This point most probably was used as a knife. Approximately half of the blade edges have been slightly beveled, indicating that it was probably resharpened at least once. The edges are very finely serrated with approximately 16 serrations to the inch. 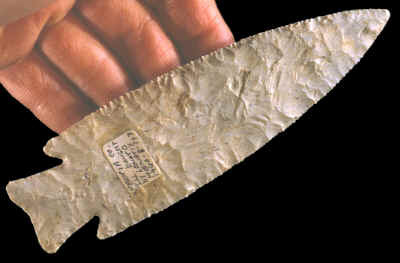 This point is made of white and blue Burlington chert and it measures 5 5/8 inches (14.2cm) long and 1 5/8 inches (4.1cm) wide. This Hardin Barbed point was flaked into shape by a skilled stone tool maker at least 8,000 years ago. It would be difficult to find many finer made examples than this one. The picture above shows three views of this point. Hardin Barbed points were named by Edward G. Scully for examples found in Calhoun County, Illinois. The majority of these points are vary well made with skillfully done pressure flaking. They are generally triangular in outline with convex sides. Several different varieties of Hardin Barbed points are known but they have yet to be named. Some even have long narrow channel flakes removed from the base similar to some Dalton points. Others have "Eared" bases, expanding to almost straight bases or concave or convex bases. Most Hardin Barbed points were probably hafted onto short handles made of wood or bone and used as knives. The edge serrations on this knife are very finely done. They were made with a sharply pointed pressure flaking tool. There are approximately 16 serrations to the inch. 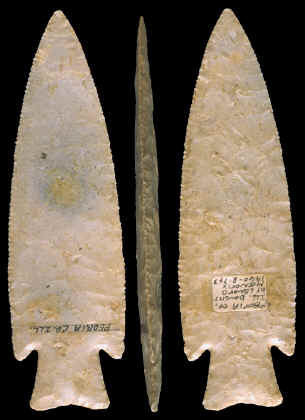 Hardin Barbed points are believed to be an eastern relative of Scottsbluff points from the Cody Complex in the western United States. Hardin Barbed points are found in the eastern U.S. from Missouri to Ohio & from Wisconsin to Arkansas. They date to the Early Archaic period sometime between 8,000 and 9,500 years ago. Justice, Noel D., "Stone Age Spear and Arrow Points", pp 51-53. Perino, Gregory, "Selected Preforms, Points and Knives of the North American Indians Vol. 1", pp170-171.